An ode to Milan, Italy, an international symbol of high-fashion, art and culture, The MILANO OTTOMAN is a compliment to the Milano Club Chair or Sofa. This design steps outside of the traditional outdoor furniture design boundaries and delivers a winning combination of whimsy and refinement. Absolute comfort is provided with its generously-sized frames and advanced seating support. The ottoman is visually lightened with the thoughtful striated rope design, clean lines and perfectly placed angles. Crafted in the highest quality comfort and durability, the MILANO OTTOMAN will stand the test of time with minimal maintenance. Its powder coated aluminum frame is expertly wrapped with premium all-weather acrylic rope in a Steel Grey finish. Weather resistant cushions are enveloped in Sunbrella Echo Ash fabric. BOTANIK offers a generous selection of Milano deep seating pieces as well as other complimentary collections for seamless coordination while mixing for the perfectly curated, sophisticated outdoor space. These deep-seating cushions are a plush 8” thick and provide the perfect balance of firm and coziness. The cushions use a premium 1.8 density foam for cushion filler as our standard. All cushion foam is encased in Dacron® fiber wrapping for an additional outer supple layer. MILANO includes two foam options -- Every time foam is compressed, it has the potential to breakdown some of the cellular structure. 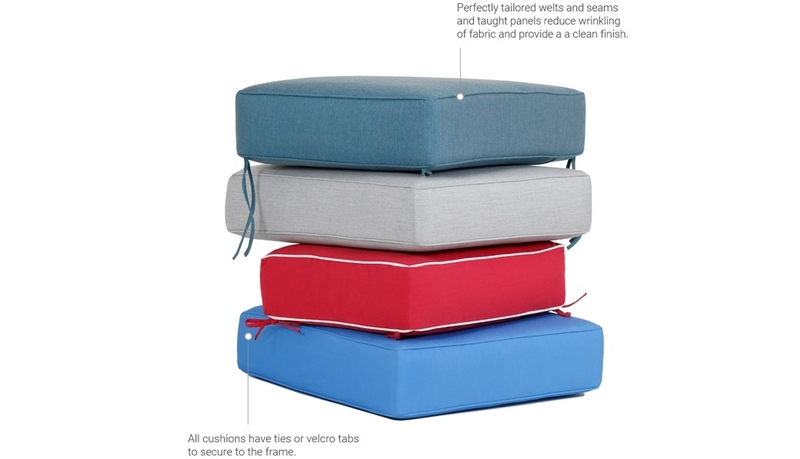 Below we will provide you with basic information on our cushion foam. In most all cases, our standard foam works functions and wears well. MILANO cushion foam is 1.8 density this is considered good to better foam and is used throughout the furniture industry. Water will drain out of it, but maybe not as fast as some people would like to depend on the climate that they are in. The second foam option is called RETICULATED FOAM, commonly known as QUICK DRY. The cell structure of this foam is very large and the cells walls that once existed are gone. The benefit of this foam structure is that water will literally flow through the foam and will dry very quickly. NOTE: Reticulated foam will not last as long as either of the other two foams due to the size of the cell structure and absence of the walls. You will experience fewer compressions prior to the cell structure failing and the cushion losing its shape. Having said this, many people will sacrifice longevity for the ability of water to drain through and the cushion to dry quickly, typically 50-75% faster than standard foam.